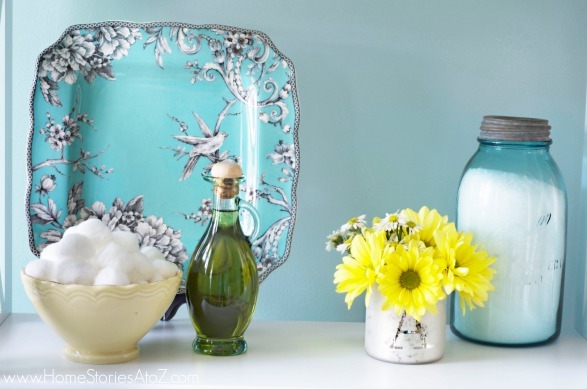 I am so excited to share with you my budget bathroom makeover today! 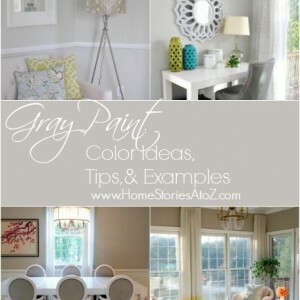 HGTV HOME™ by Sherwin-Williams asked if I’d be up for the challenge of trying out their new Softer Side color palette. Our master bathroom was more than willing to volunteer for the task. I swear I heard it whisper ,”pick me….pick me”! 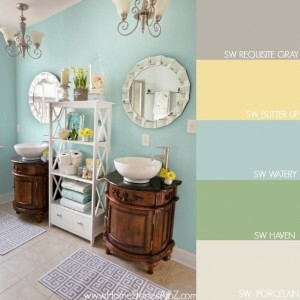 I chose to paint our bathroom in a shade called (SW 6478) Watery in a satin sheen. Watery is a gorgeous blue that changes colors for me throughout the day. It is aptly named! At times it looks more vibrant and turquoise and at others it is a bit more muted…just like a real body of water. But we are getting ahead of ourselves here! What is a good makeover without a before picture? 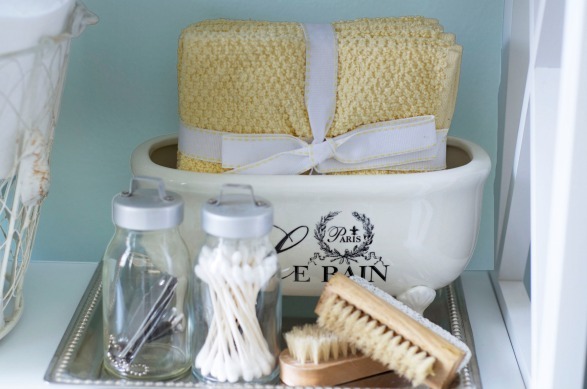 The last time I highlighted our master bathroom on the blog was at least 5 years ago! Below you can see what our bathroom previously looked like (and you can also appreciate how far my photography skills have come since that time). Our bathroom wasn’t hideous by any means, but I had grown weary of it and was ready for a change. I wasn’t interested in spending a lot of money on this makeover and worked within the limits of a tight budget. Thank goodness for the transformative powers of paint! It never ceases to amaze me. Hands down, paint is the number one DIY tool that I would take with me to a desert island. You know, in case I wanted to embellish my coconut cups or bamboo hut. To complete this room, I used a little over a gallon with two-three coats of HGTV HOME™ by Sherwin-Williams paint. 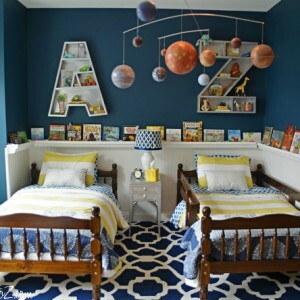 I used HGTV HOME™ paint when I repainted my boys’ bedroom and remember liking it. It is easy to work with and provides good coverage. It also is a bit less expensive than some of the other Sherwin-Williams paint lines. To complement my new “Softer Side” look, I decided to add a strong focal point to the center of the bathroom while softening the harsher lines of my previous mirrors. 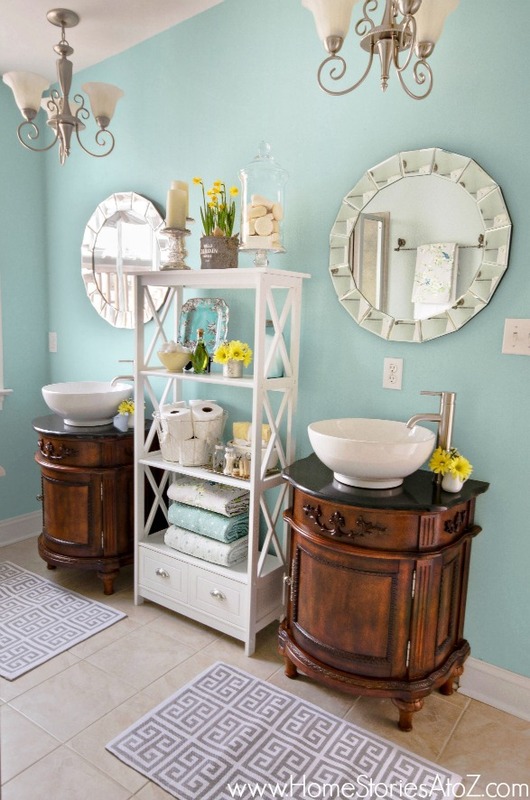 The white styled shelving unit and round mirrors changed the feel of the room from moody and dark to airy and bright. I love adding decorative and functional shelving to every space! Our bathroom does not have a closet, so the extra storage is a welcome addition. I actually use most of the pretty “props” on display. 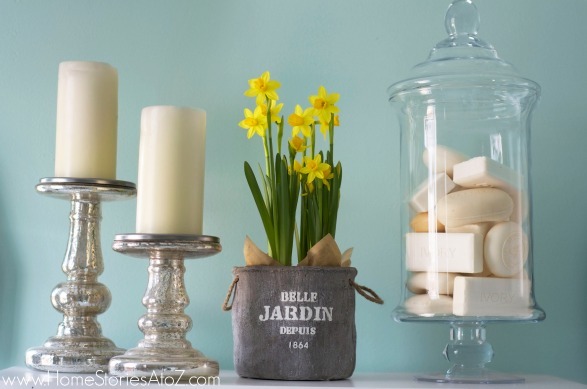 Tip: Storing extra soap in an apothecary jar not only looks lovely but keeps soap from cluttering up cabinets. Although I prefer liquid soap, my husband still swears by the good old bar. I thought the shot below was fun! Notice how my painting is being reflected in the faceted mirror to display a “bouquet” of flowers. You can also get a feel for what I was talking about earlier when I said that this paint color changes colors throughout the day. I love the depth of color in this shot and how the blue changes a bit in the light and shadows. Here is a shot from the doorway so you can get a feel for what the entire room looks like. Our bathroom is fairly modest, but includes everything I need. 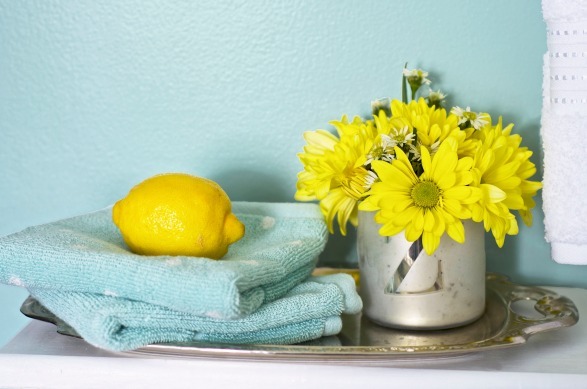 I love soaking in my tub and admiring how springy and cheerful my bathroom looks now! I purchased a few new towels and accessories to help pull the look together and celebrate the new wall color. And here is my view first thing every morning. Not bad if I do say so myself! Let’s take one more look at the before and after! Sigh. I love it! It is exactly the low budget, high impact change I was hoping for! I’ll be back next week to discuss how the HGTV HOME™ by Sherwin-Williams Softer Side palette inspired design elements for my bathroom makeover. Thanks so much for stopping by and checking out my new space! 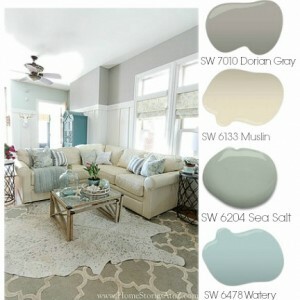 This post is sponsored by Sherwin-Williams and HGTV HOME™ by Sherwin-Williams Softer Side color palette launch. Opinions and design are 100% my own. Can you please tell me where you bought your mirrors? I desperately need to find one for my bathroom. SO pretty! I love that blue, and all the other details in the bathroom. 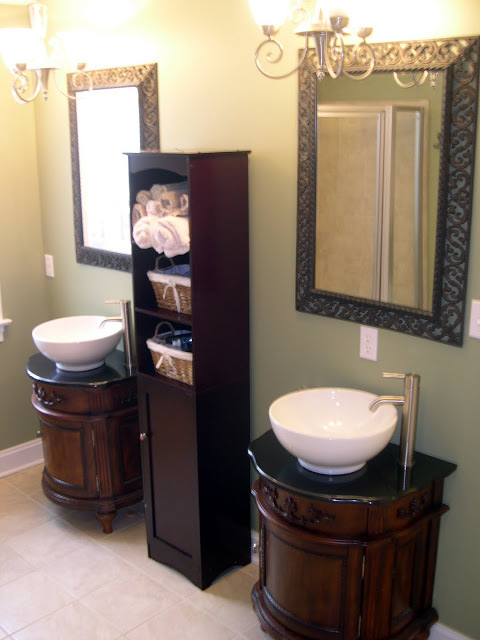 I can’t decide what I want to do in 2 of my bathrooms, so they just sit untouched! Beautiful transformation and I have to mention that I’m slightly jealous of the space. I have like 2″ to walk in front of my sinks. Sheesh! The makeover turned out so beautiful! 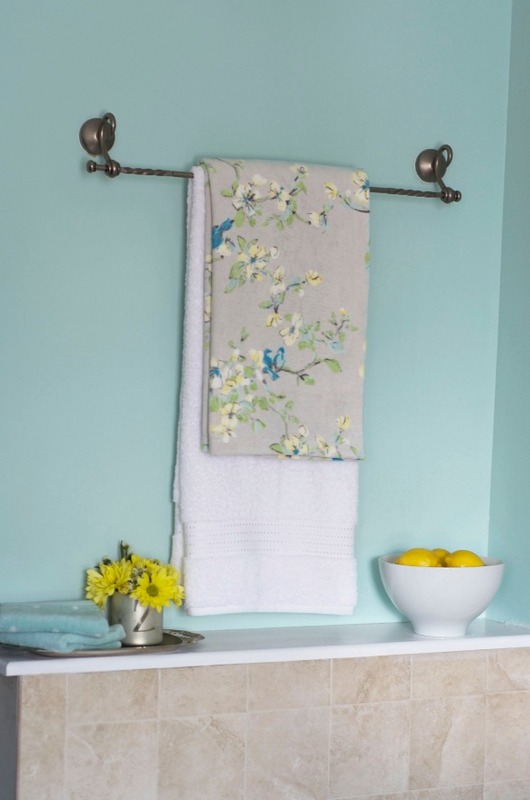 The watery blue is soft and serene, perfect for the bathroom. But those mirrors are amazing!!!! I love it all! Great job Beth! The makeover turned out so pretty! The color is soft and serene. I am so in love with the mirrors too! Great job Beth! I love the soft color palette Beth. It is so pretty and serene. 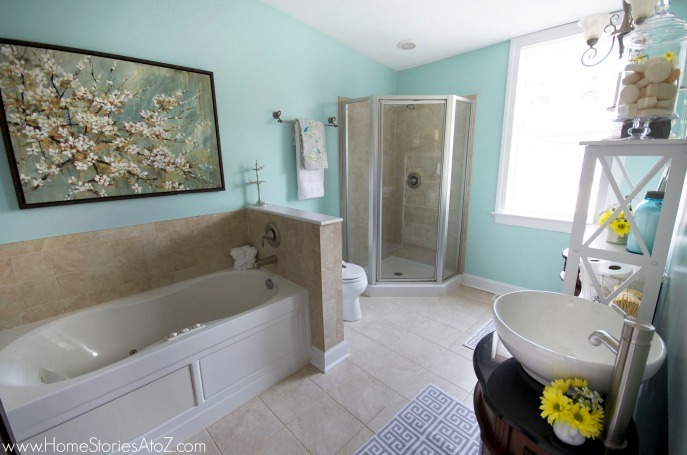 I think all bathrooms with a tub like that ought to be painted in some sort of spa color. I also love the circle mirrors. Well done friend! Oh I love the updated bathroom! And that color… Just screams “tranquil”! This looks beautiful, Beth! You know I generally wouldn’t be down for any color described as “soft” – HA! – but it looks fantastic in your bathroom! 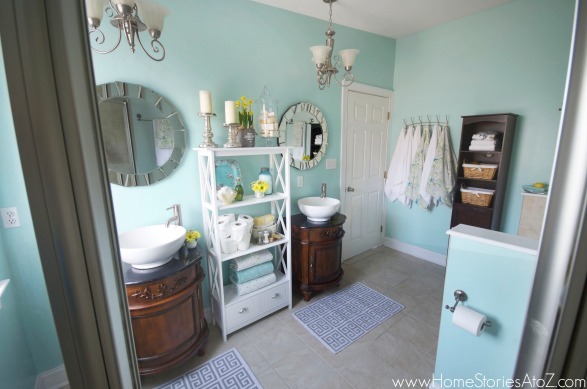 Wow, you did a great job in transforming your bathroom. First of all, what a DREAM to have such a large bathroom!! That’s amazing. 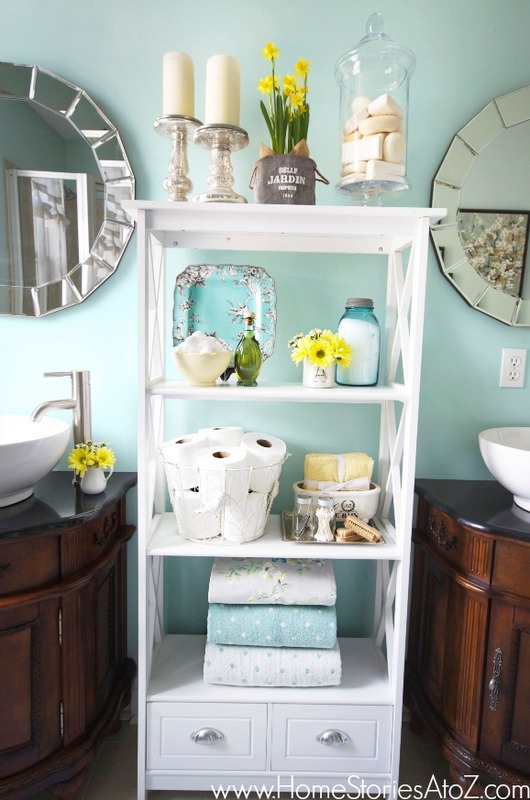 I love that you mixed up the wood with the pretty white shelves and of course, the color is beautiful in the room! And the round mirrors are perfect. Dream bathroom! Wow, I’m amazed by that total transformation you achieved with new paint! Love it!!! Love the color you chose. If that was my bathroom I’d sleep in the tub! Great transformation. I was curious where the white shelving unit came from? I love the open sides and back. I bought the floor model of this unit at a store called the Christmas Tree shop. I loved it too! Beth! This is so gorgeous! I love how bright and airy it feels!! Such a great job!! I love the wall color you chose! I feel like it is light, airy and cheerful! Perfect choice!!! What a difference paint makes! I love how much brighter the room feels now! Beautiful job, Beth! 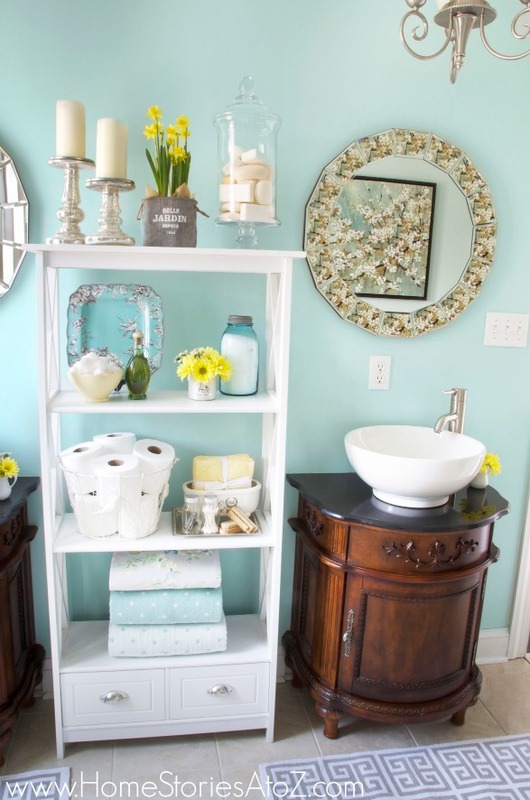 I’m a sucker for all shades of watery blues – and that one is perfect in your bathroom! Wow, Beth, that is an amazing transformation. I too can’t get over how paint changes everything and it always does. Your bathroom looks like a brand new space, love it. 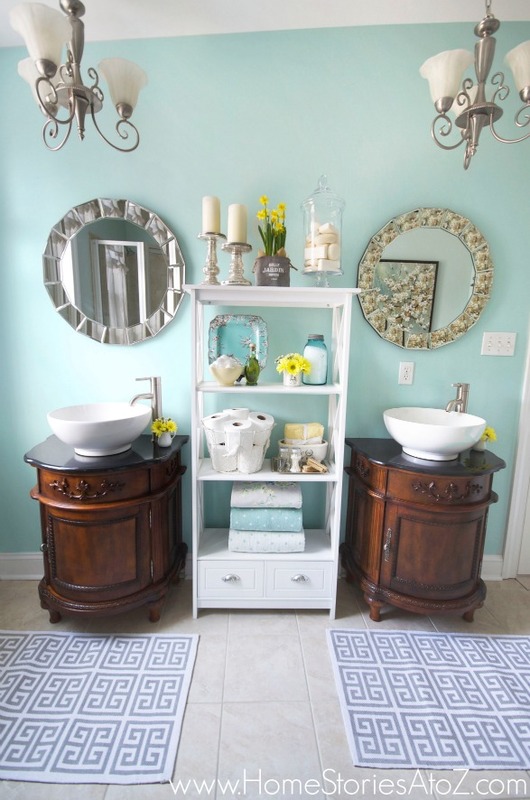 I have never seen your bath before, so this makeover is super. Love it all! I have that same color in my home, I saw it with paint samples at my builder’s office. Isn’t it beautiful in person….great color! Thanks for sharing!!!! I love this color and especially the white shelves. What kind of towel hook do you have behind the door? Ooh, this color might be what I’ve been searching for for our sitting room!! Your update looks beautiful – love the bright yellow flowers! Thanks Megan! I highly recommend Watery. It’s such the perfect shade of happy blue. Thanks for visiting me :). Wow, that’s a gorgeous bathroom… and the colour is stunning!! super gorgeous, Beth!! I love the wall color – it really makes the space so much lighter and brighter … and I love it accented with the happy yellow! !